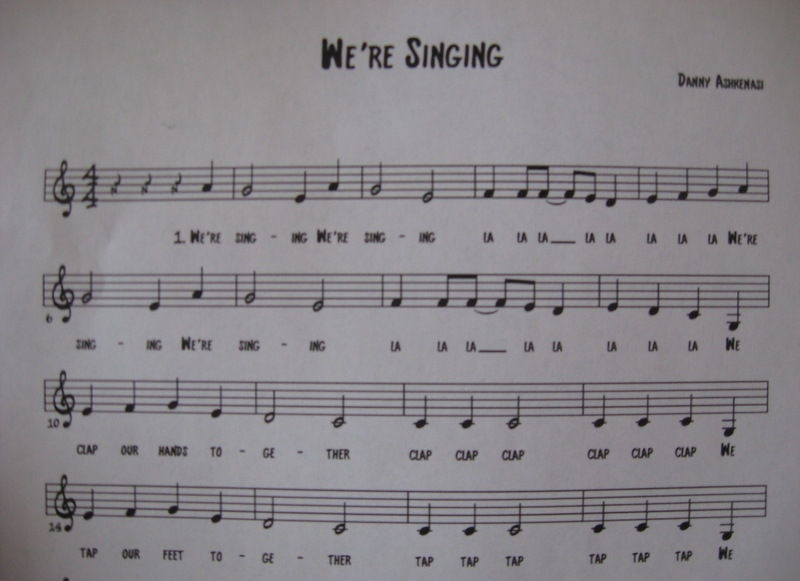 Another year and another group of Pre-K students are learning “We’re Singing” AKA Mr. Danny’s Most Sung Song – this would be the third yearly installment in what is evidently and unexpectedly turning into a continuing series (the first two installments are both copied below). And so the new-to-school 4 year olds, after learning to sing and perform how “we clap our hands together” and then “we tap our feet together”, were invited to come up with their class’ own third and fourth sung and performed action. Looking at the list of popularly chosen activities over the many years I have been teaching this song (see below), stomping our legs comes up as an oft chosen option, and nodding our heads is well represented by the even more popular shaking of heads. So far so good and usual. Pre-K 2 had other ideas. After that I asked with a certain amount of bemused anticipation what our final thing we would do together should be. Which generated some discussion as to whether we might “crawl around together” like a turtle, or whether we might “crawl our arms together” like swimmers doing the crawl stroke in a pool, also known as the Freestyle. It was put to a vote. The final tally was very close. “Crawl our arms together” like swimmers won by one vote, much to the relief of the disenfranchised adults in the room (only the kids get a vote in the classroom, not the teachers, para professionals, me…). There was much grown up aching bones dread about having to quickly drop to the floor to crawl like a turtle. So, hats off to Pre-K 2 for turning out to be a rather sophisticated group of four year olds. Yes, both classes chose shaking their heads for the fourth action (“shake our heads” has been the most commonly chosen action over the years). However, as it turns out, this was not a matter of simple coincidental duplication; there are important distinctions: Pre-K 1 chose to shake their heads “yes”, and Pre-K 2 chose to shake their heads “no”. I am a teaching artist. Which means that I freelance as a visiting music and drama teacher to conduct arts education projects in the classroom for limited time periods, usually 8-12 weeks, in schools all across the New York metropolitan area. With budget cuts having eliminated so many arts programs in so many schools, having a visiting teaching artist like me come in to do a theater or music project in the classroom is often the only way some students have any kind of arts education during their school year. It is not nearly enough, but it isn’t rare that that is it for the arts in some schools some years. I have been lucky enough – in addition to the short term teaching projects most teaching artists cycle through – to have an ongoing relationship with one school, the Children’s School in Brooklyn, which has asked me to return every year for over 15 years so far to teach music and drama and create original music theater projects with their Pre-K, Kindergarten, first and fourth grade students. The school employs full time art, music and dance teachers, but it also makes resources and time available to include me in the classrooms to conduct special music and theater work. In school I am known as Mister Danny. The children call all adults by their first name with a Miss or Mister attached at the front. Miss Margaret, Miss Sandy, Miss Beth, Mister Doug, etc. Usually Miss, especially in elementary schools, where at some sites the custodian and I might be the only male adults in the building. At the mid-sized Children’s School there are about 8 adult males in the building, which constitutes one of the higher number of male teachers I have found in one school building in NYC. Which probably explains why there are always some kids in Pre-K and Kindergarten who will call me Miss Danny during my first sessions with them. They are not trying to sass me. They just haven’t yet realized that there is a “Mister” as well as a “Miss” that one uses when addressing the adults in the room. When I first started working with the young kids in First Grade, Kindergarten and Pre-K, the schools’ arts coordinators didn’t think we could do original music theater projects (which is my specialty) with children that young (although since then we have introduced such projects in Kindergarten and First Grade at the Children’s School). They asked me to do age appropriate theater games and singing. One arts coordinator in a school without a music teacher told me: “Just sing with them. There is no singing in this school. At all. I want the children to sing”. There is something ineffably sad about that statement. I once read that one of the few requirements for school teachers in the American frontier was that they should play the piano and sing adequately. I remember my Kindergarten teacher, the wonderful Janet Matz, spending thirty minutes every school day strumming her guitar and singing folk tunes with us. To think that there are some schools where there is no singing at all – I’m not talking about actual music instruction, just simply singing some songs as a class sometime – is tragic. 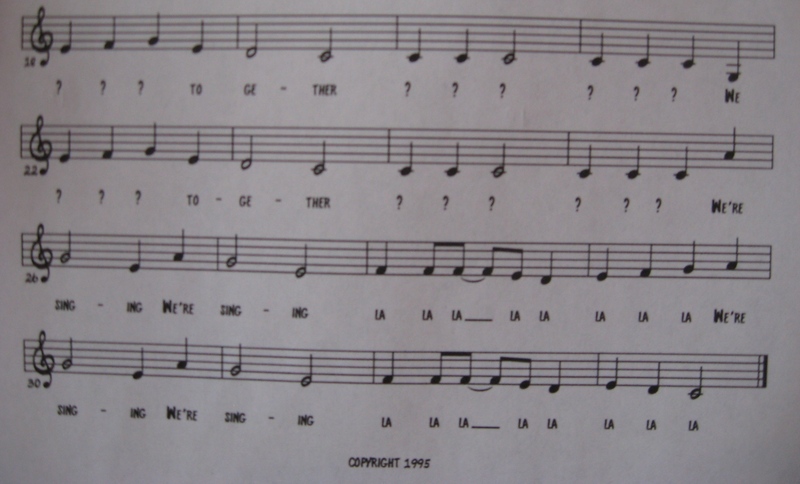 As I was preparing for one of my first assignments with young children who would be singing in school for the first time with me, I decided it would be a good idea to follow a basic age appropriate vocal warm up with an simple song that introduces the children not only to the act of singing but also to the act of making movements to a song. When I teach young children a song, I look for songs that are age appropriate but not childish (“Itsy Bitsy Spider” is a fine tune if you are 3, but it would drive me nuts to have to sing it again and again). It should have few words to memorize (since the children will be learning by ear) and also allow for learning gestures and movements that can be acted out with the singing (this way the song is taught aurally, visually and kinetically). Songs like “Hello Goodbye” from the Beatles, “Do Re Mi” from The Sound of Music and “Steam Heat” from The Pajama Game, to name a few, have proven very effective. But before I teach a “real song” I wanted to teach a simple “warm – up” song that introduced the concepts of how they would learn lyrics and melodies from me, as well as the concept of doing specific movement together at select times of the songs. I not only teach the words (in rhythm) and then the music to each phrase, I also initially indicate the melodic rise and fall with arm and hand gestures. When I first teach the “la la la’s” I initiate a conversation about going up with our voices on the first la la la ending, and down on the second. I show where our voices are going by raising my horizontally stretched hand up and down, taking a step on an imaginary pitch ladder with each note. I don’t ask them to, but many children automatically mimic the hand gestures. And so on. You get the idea. Every year every new class gets to create two new lines for their version of the song (one year one child suggested “we shake our booty together”, and the teachers didn’t object, which made for a particularly fun bum-wiggling year). This acts as an early introduction to the concept of composing and making up movements, and also probably keeps things fresh enough for me that I don’t get absolutely sick of this ditty. Because it occurs to me that over the years “We’re Singing” has been heard by more people than any other piece of music I have composed. It most certainly has been sung by more people than any other song I have composed. So far. Which is a mathematical statistic that perhaps for my own sanity’s sake should not be examined any more closely. *Ed lamented the questionable grammar of “crawl our arms together”. Perhaps I could amend it to “do the crawl together”. But then Ed added that “it’s OK for Pre-K”. This entry was posted in The Teaching Artist and tagged brooklyn, Children's School, crawl, education, four-year olds, freestyle, gallop, Mister Danny, Most Sung Song, Pre-K, teaching artist, We're Singing. Bookmark the permalink.